Essential home dressers, sold exclusively by Kmart and manufactured by Ameriwood, come in a range of sizes and finishes, yet only two styles: Belmont and Grayson. The Belmont features the most options, and although the assembly process is straightforward, the provided directions rely almost entirely on pictures, which can make the project somewhat complicated. Keep the manufacturer-provided directions on hand for a visual. Always inventory and inspect the furniture pieces before you begin, checking for chips, dents, and broken or missing parts. 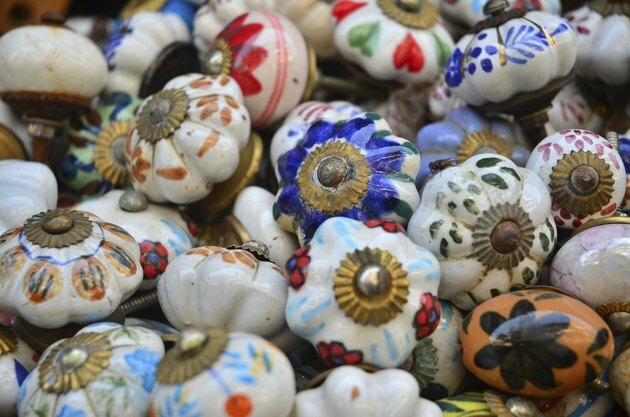 Skip the basic drawer pulls provided and replace them with colorful antique knobs. Hold the right side panel in its upright position, with the predrilled hole on the edge facing the ceiling. Secure the cam lock into the uppermost hole on the inside face of the panel, and the steel dowel rods and cam bolts in the holes along the bottom inside of the panel. Hammer the compression dowel into the hole on the top edge. Repeat this with the left side panel. Remove the stopper pins from the ends of the drawer tracks and set them aside for later use. Secure the drawer tracks to the inside of the left and right side panels with the screws provided. You need four screws per track. Set the two equal-size wood rails face up on a flat surface. Install two cam locks per rail into the predrilled holes on the face of the rails. These are the front and back rails that support and add a finishing touch to the side panels at the bottom of the dresser. Twist two cam bolts into the dresser top at the left and right corners. Secure the safety bracket to the opposite edge of the top along the back with a screw and washer. The safety bracket is optional, but it's an important addition if you have young children or live in an earthquake-prone area. Position the side rails as you would if the dresser were on its face, drawers facing the floor. Attach the back rail toward the bottom of the dresser between the side panels, with the flat side facing the top of the dresser. Secure the front rail between the two panels with the flat side facing the front of the dresser. Lock the cam locks with a screwdriver. Fold the left and right ends of the center support brace over three times to create an L shape. Secure the center support brace between the two side panels with four screws. The L-shaped ends of the rail should face the dresser bottom. Attach the top of the dresser to the side rails using the cam bolts. Nail the back panel in place carefully. Start by securing the four corners, and then add a nail to the middle of the left, right, bottom and top edges. Fill in around the perimeter with the remaining nails, spaced evenly, using a total of 18. Assemble the drawers. Attach the side rails to the drawer face with four corner braces per drawer, using the provided screws. Screw the knobs to the drawer face and secure the back panel to the drawer with screws, driving them through the drawer sides and into the edges of the back panels. Slide the drawer bottom into the plastic runners and secure them in place with the reserved plastic stoppers. Lift the dresser into its upright position. Slide the drawers into place. Bolt the dresser to the wall, going directly into a wall stud or a pilot hole outfitted with a hollow wall anchor, if desired.